Marko Cheseto, a star runner in Anchorage before and after he lost both of his feet to frostbite in 2011, surpassed the world marathon record for double amputees Monday at the Boston Marathon. Cheseto, racing on carbon-fiber running blades, completed the 26.2-mile race in 2 hours, 42 minutes, 24 seconds. In a field of more than 30,000 runners, he placed 483rd overall and 450th among men. Cheseto beat the world’s previous-best time by a below-the-knees double amputee by 28 seconds. Richard Whitehead of Great Britain set the double-amputee world record of 2:42:52 at the 2010 Chicago Marathon. He said he doesn’t know how or when his time will be recognized as the new world record. Cheseto, 35, made his marathon debut in November by running 2:52:30 at the New York City marathon to become the second double amputee in history to break the three-hour barrier. Whitehead was the first. Earlier this year, Cheseto was named the 2018 Challenged Athlete of the Year by the Road Runners Club of America. Cheseto came to Anchorage from Kenya in 2008 to run for UAA, where he earned All-America honors six times in track and cross country. In November 2011, despondent over a teammate’s suicide and not dressed for winter weather, he overdosed on prescription drugs and vanished into the woods near campus. He emerged more than two days later with his sneakers frozen to his feet. Within 18 months he was racing again. In his first race after losing his feet, Cheseto cracked the top 30 in a field of more than 900 runners in the Skinny Mini 6K race in May 2013. He got his degree, got married, started a family and became an assistant coach at Chugiak High. Chesto stayed in Anchorage until last spring when he and his family moved to Florida, where he works for Prostethic & Orthotic Associates of Orlando. He became an American citizen late last year, a couple of days after he ran the New York City marathon. 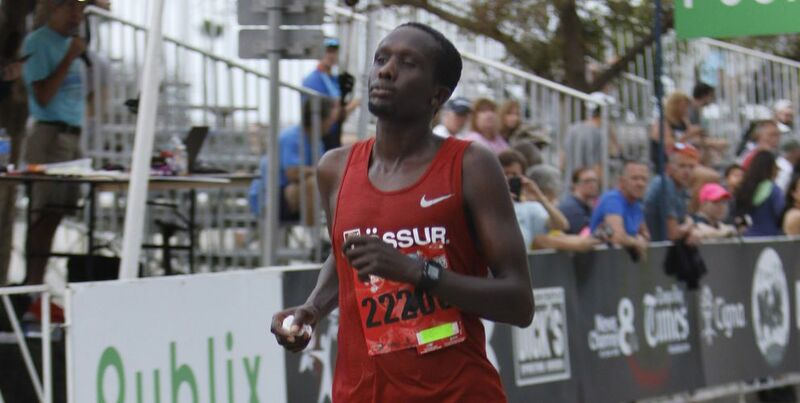 In February, Cheseto ran a swift 1:20.23 half marathon at Tampa’s Gasparilla Distance Classic. That same month, Brian Reynolds of New Jersey ran a world-record 1:19:43 at the New York City Half Marathon. On Monday, Cheseto completed the first 13.1 miles of his race in 1:20:41. “If I was only running half, it would have been faster than 1:19.43,” he said. He said his next race will be the Chicago Marathon in October. Among the thousands of runners who competed Monday in Boston were about 50 Alaskans. Keri McEntee of Fairbanks was the top Alaska woman in 2:45:28, a time that left her 28 seconds shy of meeting the qualifying time for the U.S. Olympic marathon trials. McEntee, the two-time defending champion of Anchorage’s Mayor’s Marathon, placed 50th among women and 670th overall. The 29-year-old was 10 minutes faster than she was a year ago in Boston, when runners contended with pouring rain. Also running faster this year than last year was Jerry Ross of Anchorage, 43, who once again was Alaska’s top finisher. He was 211th overall and 197th among men in 2:35:19, beating his time from a year ago by more than eight minutes. Other notable Alaska finishes included marathon newcomer Lyon Kopsack of Palmer, 23, who finished two seconds ahead of Cheseto in 2:42:22 for 479th place. John Huffer of Fairbanks, 55, placed 10th in his age group and 2,618th overall in 2:59:54, and Laura Fox of Anchorage, 38, placed 163th among women and 2,511th overall in 2:59:29.